The Franklin County Commissioners approved a tentative budget for 2019 of $163,611,900, of which $50,777,000 is the general fund. The total tax including county, library, and debt service is 30.15 mills. The budget includes a planned increase of 1.5 mills on debt service for funding the Court Facility Improvement Project. The 5.2% total increase means an additional increase of approximately $29.00 in county taxes for the owner of a $150,000 property. This is only the second county property increase in the last six years. The percentage increase in taxes is less than national inflation rates over that time. “This budget reflects the county’s main objective for 2019 which is to keep the Court Facility Improvement Project on schedule and within budget,” stated Franklin County Commissioner and Chairman Dave Keller. The $67.8 million Court Facility Improvement Project includes construction of a judicial center and administration building as well as renovations to the Old Courthouse, Courthouse Annex and the property at 340 N Second Street for the Franklin County Archives. The project addresses needs for increased security, adequate space, and co-location of offices for more efficient court and county operations, aligning with the Franklin County Commissioners’ priorities for 2019. The last major expansion of court facilities occurred in 1979. Since that time, the county’s population has increased by almost 40 percent. Attract and retain a skilled, dedicated workforce. Included in the budget are resources to update and expand information technology infrastructure, systems and security; upgrade 911 communication equipment and software; continue to expand the use of electronic document management; and support operations which deliver human services and administer justice. The proposed 2019 budget shows an increase of $41 million over the 2018 revised budget which includes $50.5 million of bond funds budgeted to be spent next year on the Court Facility Improvement Project. According to Franklin County Fiscal Director Teresa Beckner, the 2018 budget is still on track and the proposed 2019 budget plans to maintain reserves at recommended levels, projected at approximately 78 days of general fund expense. The 2019 proposed budget is available to view here , in the Fiscal Department office and at the Commissioners’ Office at 340 N Second Street until December 11, 2018 at 9:45 AM, when commissioners will vote to accept or amend the final budget. Questions and comments can be emailed to fiscal@franklincountypa.gov. 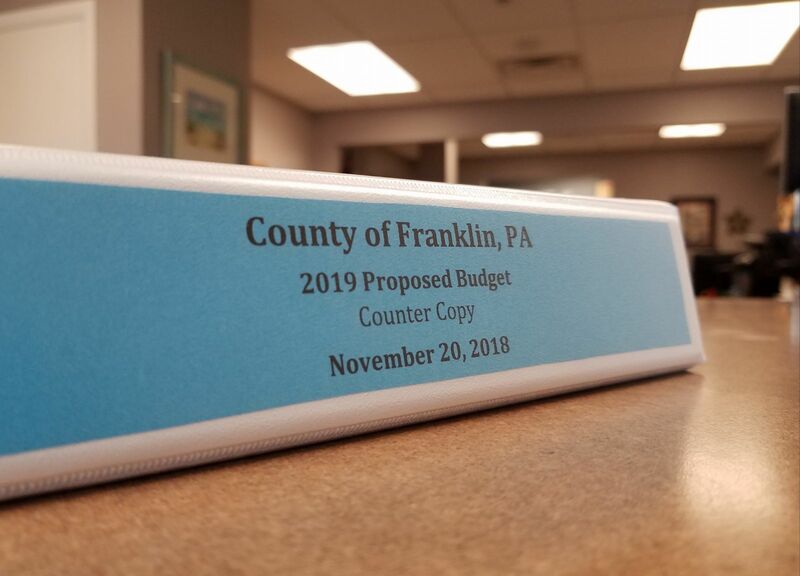 “Counter Copy” of the 2019 Proposed Budget for Franklin County at the Commissioners’ Office at 340 N. Second Street.